Dendritic spines are the post-synaptic component of most excitatory glutamatergic synapses and primary site of synaptic structural plasticity for modulating synaptic function. Activity-dependent structural plasticity in spines (i.e., spine morphogenesis) depends upon dynamic re-organization of F-actin, the primary structural component of spines. Spine morphogenesis is important for normal learning and memory and the development of neurodegenerative diseases and neurological disorders. The RhoA, Rac1, and Cdc42 GTPases regulate spine morphogenesis; RhoA inhibits spine growth and stability, whereas Rac1 and Cdc42 exert the opposite effect. In reality, Rho family regulation of spine structural plasticity is much more complex. Precise spatiotemporal regulation of Rho GTPases is with guanine exchange factors (GEFs) triggering GTP/GDP exchange and GTPase activating proteins (GAPs) stimulating intrinsic GTPase activity. At least eight Rho family GEFs regulate spine morphogenesis and these GEFs are activated through a variety of receptor signaling pathways, including glutamatergic NMDA receptors (NMDARs) and receptor tyrosine kinases (RTKs). NMDARs mediate calcium influx and subsequent activation of calcium/calmodulin-dependent kinases (CaMKs), which phosphorylate Rho family GEFs, essential for GEF activity. 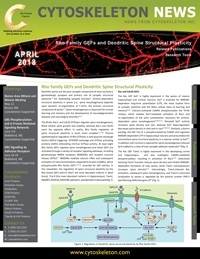 In this newsletter, the regulation of spine structural plasticity by the Rho family GEFs Kalirin7 (Kal7; the most abundant isoform in adult brain), Trio-9 (the most abundant isoform in hippocampus), Tiam1, RasGRF2, DOCK10, DOCK180, ephrexin1, and ephrexin5 is discussed.